ASUS have announced the Republic of Gamers Strix, ASUS Dual, and ASUS Turbo graphics cards based on the new NVIDIA GeForce RTX 2080 Ti and RTX 2080 GPUs, which feature support for high-speed GDDR6 memory and VirtualLink for quick, single-cable connections to next-generation VR headsets. “Our new GeForce RTX GPUs are ushering in an amazing new generation of games and immersion and we're incredibly happy that ASUS continues to bring a legacy of experience and innovation to the industry”, said Justin Walker, director of GeForce desktop at NVIDIA. 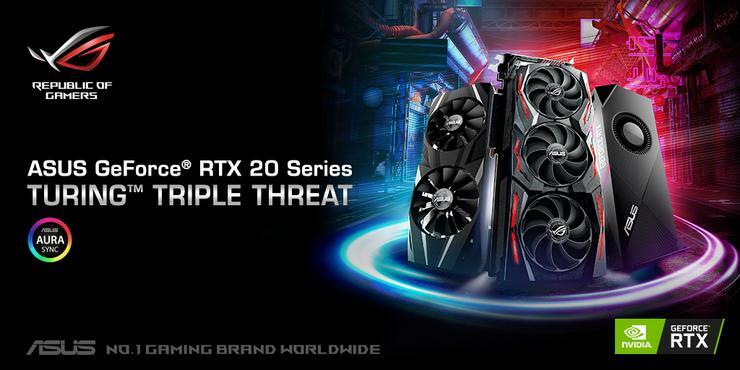 The Strix GeForce RTX 2080 Ti and 2080 keep Turing cool with brand-new Axial-tech fans that implement the latest ROG innovations, including a reduced-size fan hub to allow for longer blades and a barrier ring that increases structural integrity and downward air pressure through the Strix GeForce RTX 2080 Ti and 2080’s heatsink array. The ASUS Turbo GeForce RTX 2080 Ti and 2080 are designed from the ground up for systems with multiple GPUs or other airflow-restricting scenarios by incorporating a host of subtle design optimisations that improve airflow through the shroud and increase reliability, according to ASUS. Upgrades include an 80mm IP5X dual-ball bearing fan and a new shroud design that allows more air to flow into the cooler, even when it’s pressed against a glass chassis panel or another graphics card. Local pricing and availability has yet to be announced.